Volvo's high-impact S60 reveal motivated dealers more than any previous event and scooped the Grand Prix at the C&IT Awards. In 2010, Volvo was set to launch its new S60 - a car that combines the marque's reputation for safety with a new 'naughty' side for more daring drivers. The company needed to convey this new 'dual personality' to 5,600 dealers from 36 markets around the world. To make the event stand out from previous product launches, which have been held in Volvo's home country of Sweden, the company was keen to look at alternative destinations. Five agencies were invited to pitch, and Line Up, which organised the award-winning XC60 launch in 2008, was appointed to run the event. Volvo wanted a memorable launch event at a prestigious location, enabling dealers to gain a first-hand experience of the S60, explore the car's unique 'dual personality', and arm themselves with insights to take back to consumers in their own markets. Although Volvo was keen to look at venues outside Sweden, from a logistical perspective, a European destination was still desirable. "There was to be a focus on the performance of the car, and to do that safely, we needed a venue with the right facilities," says Line Up director Rob Leach. It also had to be a space that could be taken over for 12 weeks, to allow 25 rotations of a two-day event, tailored for up to 250 delegates at a time from individual markets. The content also had to be tweaked for each market, with many markets keen to create additional content. However, Leach says that the main challenge was making the event feel different. "Coming up with a programme format that inspires dealers to really believe in the product is challenging," he explains. "It's important to keep content current and prepare dealers for the changing demands of their customers." Following extensive research across Europe, Line up negotiated exclusive use of the Estoril Grand Prix racing circuit in Portugal and dealers were booked into the luxury five-star Cascais Miragem hotel. To reinforce the daring angle and 'dual' tone, the event was themed 'Driving Performance' - reflecting both the car's handling capabilities, and the message that the event was designed to help dealers drive sales in their own markets. On the first day, dealers were given a taste of the S60 - the new 'naughty' Volvo - at an experiential dinner at a coastal venue that was transformed into 'The Volvo Supper Club'. As the evening progressed, a series of 'naughty' surprises began to unfold - waiting staff changed into bright red clothing and the ambient music and lighting was intensified to give the feel of a trendy nightclub. Cheeky guests who dared lay their hands on a giant pane of opaque glass bearing the words, 'Do Not Touch' were surprised when a racy red S60 was momentarily revealed; hidden rooms of Xboxes allowed dealers to race virtual S60s around a simulated Estoril track, and a 3D film of the S60 in action was commissioned specially. 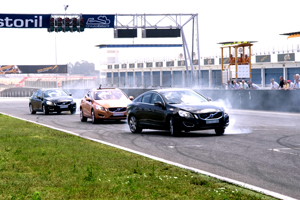 On the second day, the S60 was revealed to dealers in a 'car ballet' on the Estoril track, and delegates took part in a mix of high-impact experiential activities and demonstrations. To showcase the S60's driving capabilities, four on-track tests were devised - Pedestrian Detection, City Safety, Blind Preview and Queue Assist. A team of professional drivers gave dealers an exhilarating drive around the Estoril track, demonstrating the car's handling capabilities. Dealers then drove the circuit themselves, guided by an instructor, and test-drove the car on a planned route of the region's dramatic coastal roads. "What really made this event different was the amount of time dealers got to spend in the car," says Leach. "They got about 25 per cent more time behind the wheel than at previous events. We really pushed the limits and immersed the audience in the car, but with the right guidance, and in the right conditions." Volvo Car Corporation (VCC) launch and marketing events manager TJ Karl says: "This exceptionally engaging experience surpassed all expectations. Importantly, the agency was able to react instantly to the individual markets' different requirements, which meant that the event ran seamlessly from start to finish." VCC project manager Helena Emms adds: "This was unquestionably Volvo's most exciting launch yet and the delegate feedback has been record-breaking. Every aspect of the event, from the choice of venue to logistics and planning, has exceeded our expectations." The event motivated dealers more than any other launch in Volvo's history and dealer ratings of the S60 rose from a pre-event 76.8 per cent to 94 per cent after, results which led to it picking up three C&IT Excellence Awards: Automotive Event of the Year, Product Launch of the Year and the Grand Prix. Overall, the dealers gave the event an average score of 4.52 out of 5, up from 4.1 awarded at the previous global dealer launch in 2008. Individual aspects of the event also scored consistently highly. Delegates rated the plenary sessions 4.24, the S60 dynamic drive 4.48, competitor comparison drives 4.27, open-road driving 4.27 and the hotel experience 4.23. By December 2010, global retail sales of the S60 had reached 13,798 units, contributing to an overall rise of 11.6 per cent in Volvo's global volume sales across its full range from 2009 to 2010.